Read on to discover how to begin your search for a job in another country with the help of these 5 websites – all created to make your journey a little easier! GoAbroad is a well-known education and experiential international travel site. 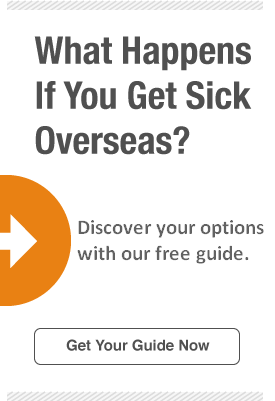 With a database of over 18,000 verified programs to choose from, it is an excellent resource for people wishing to volunteer or intern overseas, teach English in another country, or study abroad. Select one to see a list of featured programs in that category. You can click on any of the programs to read a summary and reviews written by previous participants. If you are overwhelmed by the number of options and not sure how to choose one, just click on the “Help Me Pick a Program” button at the top of the home page and fill out the questionnaire. GoAbroad will match you with programs that best suit your wants and needs! If you are a student, you can use this site to find scholarships to help cover program costs. If you are interested in getting a teaching job, GoAbroad can also help you get certified beforehand. Choose from a selection of TEFL (Teaching English as a Foreign Language) courses, which can be completed online. The vast majority of employers will not hire teachers who don’t have a TEFL certification, so taking the time to complete one of these courses will greatly increase your chances of getting a job teaching English abroad. Q: Can I get a TEFL job without a degree? A: If you don’t have a bachelor’s degree, you may still be able to get a job teaching English abroad! While there are countries and schools that require their teachers to have a degree, there are also those that do not. Here are 6 of the best countries to teach in without a college degree! Q: Can I get a TEFL job if I don’t speak a foreign language? A: Yes. The only language you are required to know in order to teach English in a foreign country is English. Not knowing the country’s local language will have its challenges, but it can also be beneficial to your teaching. Many schools actually prefer that their English teachers don’t speak the local language so the students are fully immersed in English. Transitions Abroad, named because of its mission to help people “transition” to a greater understanding and appreciation of the world, is an excellent resource for anyone looking to live and work overseas. Interested in teaching English abroad? What about working on a farm? Or in the tourism and hospitality industry? Or perhaps you’d like to be an au pair? You can search through job opportunities in all these categories. Greenheart Travel gives teens the opportunity to attend a language camp abroad, volunteer in Costa Rica or Sri Lanka, or study abroad in countries such as Argentina, Costa Rica, Germany, Japan, New Zealand, and more. Adults can choose between a variety of volunteer and work abroad programs. You are sure to find an opportunity that sparks your interest, whether it’s environmental conservation in Peru, being a summer camp counselor in Italy, teaching English in China, or one of the Greenheart Travel’s many other programs. If you are interested in the idea of teaching English in a foreign country, but not sure yet if you want to commit to a semester or yearlong contract, then the Homestay Abroad program may be a good option for you. This volunteer position gives you the opportunity to live with a host family for one to three months, giving English language lessons 15 hours per week. British Universities North America Club is a program that specializes in overseas work and volunteer opportunities. At the top of its home page is a “Find My Next Adventure” tool, which you can filter by destination—there are programs available in countries on every continent expect Antarctica—or by interest—summer jobs, hospitality, marine, wildlife & conservation, construction/manual work, teaching, etc. Make a selection and the website will provide you with a list of all the programs that fit into that category. Click “Find Out More” to learn about the program’s highlights, costs, and duration and discover whether you are eligible to participate. Many of the program options are volunteer opportunities and internships. Want to teach sports to disadvantaged children in Africa? Or volunteer at an orphanage in Nepal? Or intern in Valencia, Spain? With BUNAC, you can choose from these programs and many more. BUNAC will assist you with the process of applying for your work visa and provide you with resources to help you find jobs and accommodations once you have arrived in your chosen country. These programs are great for those wanting to take a gap year before heading off to school or anyone wanting to take a break from their career to be a little adventurous for a year. You will not only have the opportunity to work abroad, but also to explore new places and meet new people. Easy Expat contains international classified advertisements, discussion forums, and job listings for expatriates all over the world. 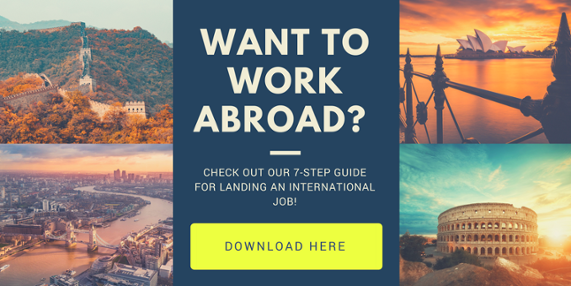 This resource can help you not only find a job abroad, but also an apartment, a roommate, used furniture, or a car. If you sign up for the free membership log in, you can participate in the chat forums and ask any questions you might have about what it is like to work abroad in your country of choice. Employers from foreign countries review the CVs posted to this website, so it’s a good idea to keep an updated version of your resume available for viewing.